"Three days ago, my father went to pick up fuel from the gas station for our generator at home. He’s still not back." Endless queues at shops and gas stations, garbage piling up in the streets, hospitals lacking staff and resources… This is the situation facing Farah and Rasha, two young women living respectively in Yemen’s capital, Sanaa, and in the Northern city of Saada. For security reasons, their names have been changed, but their stories are real. “Every few days I decide to walk to the office. Sometimes to see if there’s power or internet there. To use the phone, recharge my mobile, go online. Or just to get out of the house. But this is a story about the walk itself. The queues are getting longer. In spite of the ongoing violence in Sanaa, people are waiting night and day. Men queue at the gas stations, women and children at the bakeries and markets. They know that fuel and wheat are out, but they’re desperate. So they wait and hope that a shipment of supplies will come in while they’re in line, and maybe – just maybe – they’ll get a little bit of anything to keep them going. Water is also running out. And on my way to work, I pass a courtyard where the landowner dug a water well and placed a fountain so that Yemenis can get some clean water for free. For thousands, these are now the only sources of clean water in Sanaa. Because of the water shortages, the cost to refill your water tank at home has tripled. Water pumps and water tanks that deliver water also require fuel. In Sanaa, we’re on the verge of an environmental and health catastrophe. 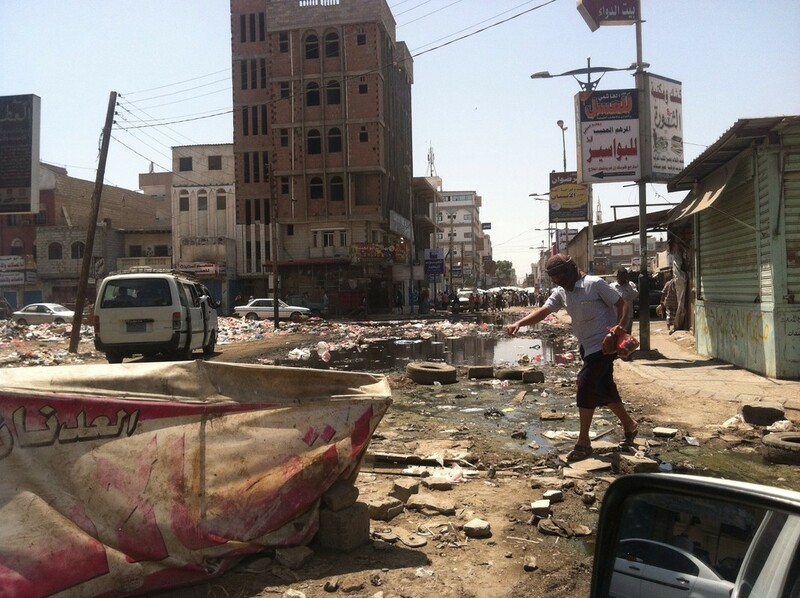 There is now more garbage than people on the streets of Sana’a. Garbage is piling up around the city, as without fuel, garbage trucks have been unable to pick it up for a month now. They also need fuel. Hospitals and medical centers are no longer coping. Many of them were completely destroyed, and the ones that are still functioning have to deal with an added burden. Many nurses and doctors have fled the city, the hospitals lack medical supplies, clean water, and power. Refrigerators are no longer working, and the blood banks are out of blood. At the moment in Sanaa, you are very likely to die of a minor injury, simply because all hospitals have to prioritize emergency procedures due to lack of supplies. “Three days ago, my father went to pick up fuel from the gas station for our generator at home. He’s still not back. At night, the house shakes with every bomb, and I run out of bed to my brother and mother. My mom asks us to block our ears and close our eyes whenever we hear an explosion. The house is pitch-black: we’ve been out of fuel, and power, for three days. Mom tries to calm us down, she says dad will be back soon with fuel and everything will be ok, “he must’ve travelled further away to get it this time, and he’s just waiting for the fighting to calm down, so he can walk back home”. Her eyes don’t lie. We know there was an attack on the fuel station three days ago. Mom used to spend the day calling relatives asking for help. Now the telephone is not working, so she is asking the neighbors if they can help – or if she can use their phone to call for help. We know we can’t leave – we don’t have money to rent a car or take a taxi. 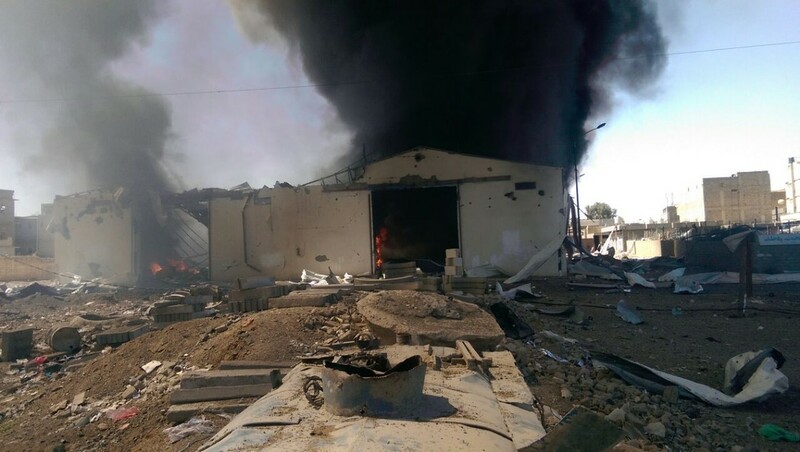 But our neighbors are in a similar situation, and many will not receive salaries this month, because the post office in our area has been reduced to rubble by the ongoing violence. Mom says we are going to visit our uncle soon, and maybe stay with him. We usually get all dressed up when we visit him. Now she won’t let us. Despite major security issues, Oxfam is continuing to provide emergency aid to the most vulnerable people in Yemen. Since the beginning of the conflict, we have delivered life-saving support to 60,000 people. However, as long as the conflict persists, the lives of Farah and Rasha and thousands like them will continue to be disrupted. We are helping families affected by the conflict in Yemen to buy basic supplies and get access to clean water and sanitation services.